-Capt. 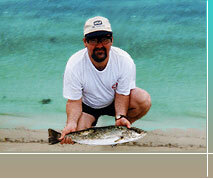 Wes Rozier a native son with 30 years of fishing experience in the Gulf Coast inshore waters. -A guide boat/charter boat of 20 feet powered by a 115 Evenride ETEC outboard motor. -Fishing License, ice, tackle, bait and live bait. *Rates are per trip not per angler and include the Capt., his boat and all gear/bait. I will give you directions to the best fishing tackle and bait store. I will book you with the BEST deep sea fishing captain in the area for the best red snapper fishing you can find.